Custom Printed RB Flexible Blues Brothers Sunglasses are trendy and colorful promotional items which will make your brand outstanding in parties and fun activities. These custom classic sunglasses are presented in Blue, Orange, Green, Yellow and Pink frame color options along with smoke lens. Clothing brands and party supplies stores can make the most of the 1-1/2" W x 1/4" H imprint space in these custom sunglasses. Order these sunglasses with flexible plastic frame and temples, and 100% UV protection and get free online proofs and enjoy fastest turnaround times. 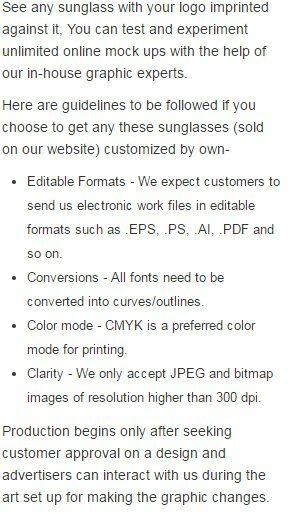 Request a quote to know the value savings that you can avail on bulk orders of Custom Printed RB Flexible Blues Brothers Sunglasses.